The Royal Navy’s newest helicopter has fired a torpedo for the first time, dropping a Sting Ray into the waters of Falmouth Bay. An AgustaWestland AW159 Wildcat of 825 Naval Air Squadron decamped from Yeovilton to Culdrose for two days on the ranges off the Lizard Peninsula to ‘play with’ the Fleet Air Arm’s main sub-hunting weapon. The AW159 Wildcat Helicopter Launches a Sting Ray Torpedo for the first Time. This is the Royal Navy’s principal weapon in the fight against submarines leaving its rack on the Fleet Air Arm’s newest helicopter for the first time. A Wildcat of 825 Naval Air Squadron spent two days over Falmouth Bay practising torpedo attacks, culminating in the launch of a dummy weapon. In various forms, Sting Ray has been in service with the Royal Navy for more than 30 years. It’s carried by frigates (thrust out of launchers by a high-pressure air) and Fleet Air Arm Merlin and Lynx helicopters (the former carry four torpedoes, the latter two); Royal Navy submarines kill their underwater prey with the much heavier Spearfish. 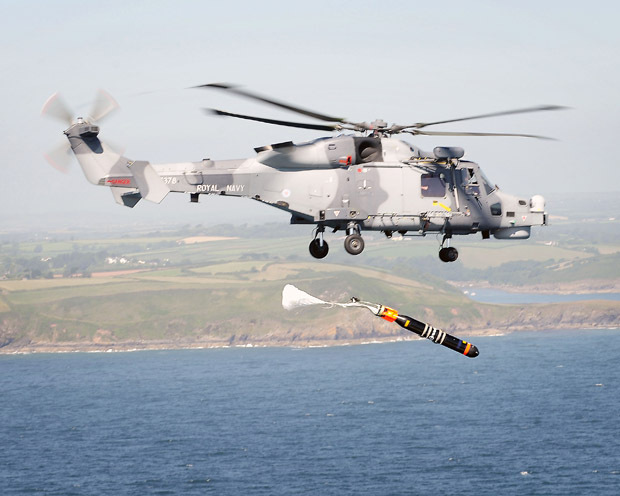 The Lynx’s successor Wildcat is beginning to enter front-line service – the first is currently on deployment with HMS Lancaster in the Atlantic – and although it’s undergone extensive trials and testing over the past five years, until now it’s not dropped a torpedo. That was put right on the range off the Lizard Peninsula – brought back into use by the Navy for torpedo tests only last year after a 15-year hiatus. Normally, Sting Ray is packed with a 100lb explosive charge, racing through the water at speeds in excess of 50mph as it closes in for the kill. For the dummy runs and firing off Falmouth, a TVT (Training Variant Torpedo – 100lb of concrete replaces the high explosive) was loaded aboard Wildcat ZZ378 at RNAS Culdrose in nearby Helston, not ten minutes’ flying time from the Cornish port. As with a live Sting Ray, a drogue parachute slows the weapon’s entry into the water but the torpedo is set to float when it has completed its run and is then recovered by SERCO using boats working out of Falmouth.